For too many people the Brussels sprout is the vegetable suffered on Christmas day after being cooked to a recipe of ‘boil until ruined’. Cooked properly they are delicious and they can be enjoyed fresh from September through February. 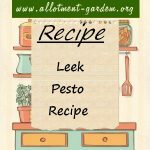 A different take on the Italian dark green sauce for pasta which originated in Genoa. Makes the most of leeks which are past their prime. Recipe for Brussels Sprout Salad. Yes really - a salad based on sprouts! Properly prepared and cooked, they can taste really well as this dish proves. 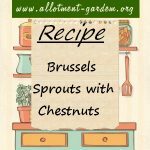 Recipe for Brussels Sprouts with Chestnuts. Banish soggy sprouts forever! You can also fry some bacon, cut into small pieces, with the chestnuts. Recipe and information for Brussels Sprouts Basic Method. You can vary the basic method by adding garlic and / or sage to the butter before frying them.